Our natural world, Earth and beyond. Please visit pages below to view animations. 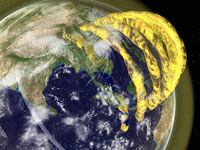 This animation illustrates "plasma tubes" associated with Earth's magnetic field lines. View animation. Magipics has supplied visuals for a number of scenes in the "Our Living Climate" show at Melbourne Planetarium. View animation. 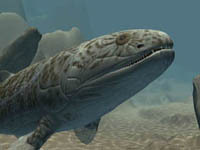 Creature animation and interactive touch screens, for the "600 Million Years" exhibition at Melbourne Museum. View animation. 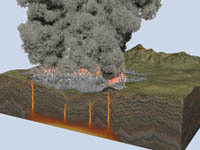 Volcano animations for the "600 Million Years" exhibition at Melbourne Museum. View animation.